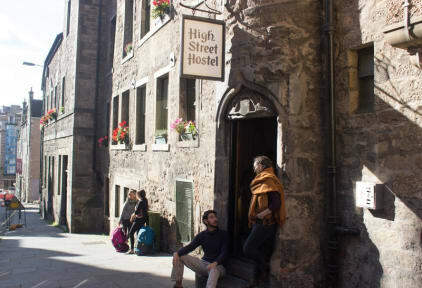 High Street Hostel is the perfect place to stay if you want to explore Edinburgh. It is conveniently located on the Royal Mile which means you can start your day in the centre of town. There are many nice pubs and restaurants nearby, and it is right in between Arthur's Seat and Edinburgh Castle; two of the city's highlights. The staff is friendly, the rooms are clean, the prices are good, and there's a common room where you can meet fellow travellers. I recommend High Street Hostel to everyone! MacBackpackers' hostels are simply the quintessential hostel you've always wanted to visit, but didn't expect existed. High Street Hostel especially. Perfecte ligging, gezellge sfeer en leuk personeel. Alles is schoon en wordt goed aangevuld. Van alle gemakken voorzien. Prima ontbijt voor maar 1,90. De keuken mag je ook gebruiken en er is een gezellige huiskamer. My stay at the hostel was really nice. The ambiance is awesome: it was easy to meet new people and I had a lot of fun with both other guests and staff. All the facilities were very clean and well looked afther. Bathrooms had fresh towels a couple of times a day and the kitchen was without stains and dirty cutlery. There were not a lot of toilets and showers near the bedrooms, but for some reason I never had to wait to use one. The beds are not great, but exactly what you'd expect of a hostel. Very nice hostel, super location, breakfast available and cheap, chill beds, lockers and fine showers. Also a very nice common room! Nicely located hostel with a cool vibe in the common rooms. Had a good stay! Nice and atmospheric hostel on perfect location. Great living room where one can have good cheap breakfast, free coffee throughout the day, relax on a couch or play pool. One of the few hostels these days where people not only stare at their phone/laptop screens, but also a vibe where people actually engage in some interaction with fellow travellers. Rooms could use a little maintenance, especially windows/ventilation, otherwise clean place with good and clean towels available at the bathrooms. Good hostel right in the centre of Edinburgh. Friendly staff and a very spacious living area/kitchen. You also get a discount at a nearby pub when staying here. I enjoyed my stay.